AC Milan could reportedly look to swoop for Arsenal midfielder Aaron Ramsey as he continues to edge closer to being out of contract. 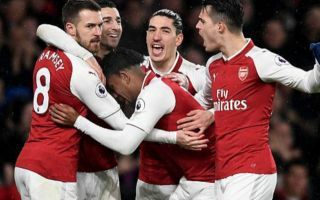 The 27-year-old has been an influential figure for the Gunners since arriving from Cardiff City in 2008, going on to make 333 appearances for the club while helping them to win three FA Cups. However, with his current contract set to expire next summer and with no suggestion made publicly at least that a new deal will be signed imminently, there are growing concerns over whether or not Ramsey will commit his long-term future to Arsenal. Those fears for Gunners fans won’t be allayed by the latest speculation either, as The Sun report that claims in Italy suggest that AC Milan have set their sights on the Welshman and may even make their move in January in a possible cut-price deal before he becomes a free agent at the end of the season. Further, and perhaps most worryingly for the Arsenal faithful who may wish to see him remain at the Emirates, the report also adds that Ramsey may well be temped to make the move to Serie A and join the Italian giants. Given his technical quality and ability in possession as well as his work ethic, there is no reason to doubt that Ramsey could be a success for Milan, should a move materialise. With Gennaro Gattuso relying heavily on his preferred midfield trio of Giacomo Bonaventura, Lucas Biglia and Franck Kessie to start the new season again, the Italian tactician does need quality reinforcements in that department to help take Milan to the next level. Ramsey’s ability to pull the strings in midfield and to break forward to score goals could see him emerge as ideal competition for Bonaventura’s role, but time will tell if he can genuinely be convinced to leave Arsenal after a decade in north London.